Last year was our first year with a blog. 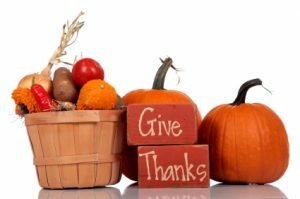 Â At Thanksgiving, we shared about the things we are grateful for and it seemed like a tradition worth carrying on this year. As we get ready to enjoy Thanksgiving with our families this year, we recognize that we have a lot for which we can be thankful.Â This year has continued to be challenging for many and we have not been immune to those challenges. Although we became a smaller company this year than we were last year, we continue to be fortunate to have an executive team that helps us navigate these times through mentoring the team and offering a sense of calm. Our company has continued to expand on a personal front â€“ a few marriages, an engagement, several new babies plus a few on the way, and much more. If you have a little extra that you can give this year, support your local food bank to help provide nourishment for families in need of this holiday season. 2010 has been a year filled with things for which we can be grateful. Â We hope that you and your families enjoy a very happy Thanksgiving!